There are some athletes that live for the challenges of a mentally and physically tough race. New Jersey’s Brian Norling is that athlete. Norling took on the demanding terrain of the Cathedral Pines bike race for the seventh year in a row and, took home the win for the third time. By fueling with XRCEL, Norling topped the podium again after six hours of pedal pushing, putting in 80 winning miles. Check out how, with his family’s support, Norling stays focused and fueled throughout the intense racing season, and how he plans to tackle next year’s race calendar. XRCEL: What is it that motivates you to race Cathedral Pines, a clearly, grueling race? Brian Norling: The race has a party atmosphere. It’s basically the season ending race. Overall, the race is physically and mentally grueling. Once you are into hours four, five, and six, it starts to mentally wear on you. Having been at the race six other years does help a lot. I know the course well. It’s always good to know where you can push the pace or where you can grab a drink. With Cathedral Pines having such a different race make-up than a triathlon, how do you prepare and execute your fueling plan on race day? This is a self-supported race, so there are no aid stations on the race course. After each 10 mile loop, you come out of the woods and around a field. This is where all the cars are parked. You stop at your car and fuel up or grab nutrition. In this race, I’m taking enough nutrition to make two laps without stopping. How did you use XRCEL during your Cathedral Pines race for all 80 miles? XRCEL was my main source of fueling for the race. By using XRCEL in training and racing, I have a really good idea of how long I can go before more is needed. I took the first bottle about 10 minutes before the start. It’s a mass start with all the racers going off at once, so you have to be ready to go hard from the start. I had one full bottle at the start of laps three and five. I also drank half of a bottle at the start of lap seven as I was feeling good and was getting close to the end of the race. Since you have won Cathedral Pines in the past, how do you set your race expectations? The race is held the third weekend in November. The race season gets long, so it’s tough to stay sharp and be ready to race. I know a lot of the participants in the race, but you never know everyone who signs up. Completing eight laps is always the first goal for the race. This year there were only seven racers that completed eight laps. I aim for the podium every year, but you never know what will happen in six hours of racing. I just stay at a steady pace and hope all goes well. Now that your season is over, what do you look forward to doing the most and how will you spend your off-season? I look forward to fun mountain bike rides with friends, having a good time on the bike, and not really worrying about actual training. I spend most off the off- season riding bikes and I don’t do a lot of swimming or running. I just try to relax. How do you balance your training schedule with running a business and family time? It’s one of the toughest things at times. Many things get in the way at times and I have to make time to fit everything in by budgeting my time wisely. With two kids who are very active in sports and school, their schedules are always my priority. Most of the time, I train early in the morning as the afternoons are busy. Some days I’ll do my run at lunch and try to eat while I’m working, but working as a mason, that can be tough at times. Knowing that the family is behind me takes a ton of stress out the equation. My wife Nancy is super supportive of the racing. It’s also great when they can make a race. It’s so awesome to hear and see all three of them at the races. They make me push harder! How does your training and racing compliment your life as a husband and dad? I feel it shows my kids that if you put your mind to something, you can achieve whatever you want. It’s a good thing to be in shape so I can keep up with them. My daughter is into running and swimming, which is great because I can spend time with her, enjoying the same activities. With such a successful racing year, how do you set your next year racing goals and expectations? I look back at each season and see where I can improve. I know time is against me as I get older. I try to layout the season and the goals early in the year so I can have a good idea where the training has to go. I’m not really sure what 2019 will bring. I would like to do NJ State Triathlon again. How can I pass up the race being the 2x defending champion? I also have a few bike races I’d like to do, but they are all tough to get into. I have also said to my wife that I’ll be racing less this year as the business is taking up lot of time and the kids are growing up fast. I don’t want to miss anything they are doing. What was the best lesson you learned this year from training and racing? I learn a lot of lessons through the year. It’s really hard to pin down one thing, but one thing learned is to listen to your body. Some days you just don’t have it. I’ve had those days. I just get through the workouts and take some more down time. I’m also big believer in quality over quantity. It’s what works best for me, having limited time. What advice would you give an athlete who is trying to make improvements in their training and racing? Concentrate on that thing that needs the improvement and take a couple weeks to work on it. If you’re a triathlete training in three sports, this can be tough, but you need to put in the time to improve if one thing is holding you back. If it’s more power on the bike, put in some really good weeks on the bike and do easier runs during the week. Being efficient at all three sports in triathlon is what you are aiming for. What does your racing schedule look like for next year? I have a few races in mind for next year, but two of them have a lottery system in order to get an entry. I won’t know about those races until mid-January and one will control the season if I get in. 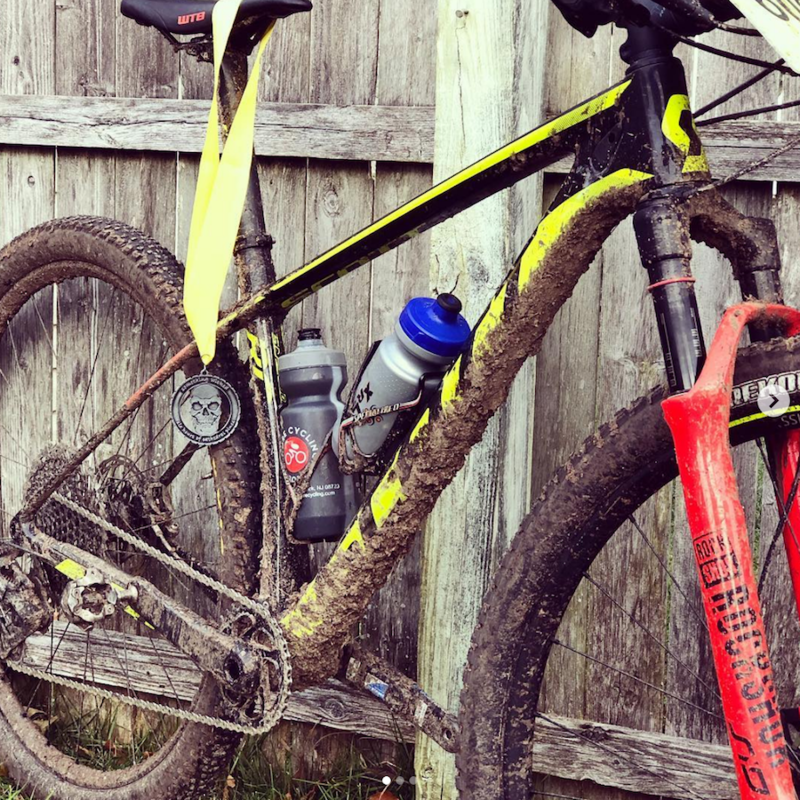 One race is the Dirty Kanza. It’s a 200-mile gravel race in Kansas. It’s also a self-supported race with aid stops every 50 miles. When you go into a race, knowing you are in great shape and have had a successful year to date, how do you stay focused and channel your confidence? It’s not an easy thing. I know I have a target on my back. I give 100% at the races. I don’t want to be driving home and thinking “What if?”. How do you continue to challenge yourself in racing and in life, having had so much success? In racing, the challenge for me is to see how long I can stay successful at racing. I always want to better my time on a course where I have competed before, which is getting tougher every season. There is always somebody else out there who also wants to win just as bad. What was your favorite racing moment this year and why? This year had to be NJ State Triathlon. Winning the sprint race overall was just amazing! The week before the race, I was having a bad week training. Nothing was clicking. Every workout was off and it was getting in my head. At the race, I had a horrible swim! I remember someone yelling 15th. I figured it was over. I had to make up a lot of time on the bike and run. In a sprint race there isn’t a lot of time, but I put my head down and left everything on the course to make up the time. I made up the time on the bike and had a very good run, which was enough to hold on for the win. It was so awesome to hear your name announced as the race winner and NJ State Champion. What are some bucket list races for you? As far as triathlon goes, it would have to be to race Kona! The problem with that is I have no desire to do a full Ironman to qualify, so the lottery is my only way in. For cycling, I have a few as there are so many interesting races around. The one I’m trying for this year is Dirty Kanza.